The mini-trip was just what we needed- four days in paradise. We spent mornings taking advantage of our free breakfast, too much advantage, probably, ordering every juice on the menu and hoarding side dishes to ‘save for later’. Afternoons were spent poolside with our magazines and comic books (I trust you to figure out who was reading what…) and evenings meant trying out new places in the city as long as they were beachfront. It was fantastic. It served its entire purpose beautifully; to get me tan, to get him rested, and to get both of us relaxed…until Friday afternoon. It is safe to say that I am not an adventure seeker. It is even safer to say that I have the same level of desire to go outside my comfort zone as a three month old child. With that said, however, I love to experience new things with my hubs. The two statements make a funny pair, because they constantly cross each other out. As I said before in my posts about our Honeymoon, with the kayaking on the ocean, swimming with sharks, climbing to the top of the Sydney Harbour Bridge in Australia and so on-I married a man on a mission to rid me of all fear. On Thursday, we were laying on pool chairs, sipping pineapple juice with cold towels on our foreheads when the concierge walked up to my husband and said, “Here are the pamphlets you asked for, sir.” Oj looked at me and said “Wanna go whale watching tomorrow?” I was extatic. I of course said sure and rolled over to assure proper pigment distribution…my tan is first priority, always. As I dozed off, I heard the concierge ask if we would rather go on a tour boat or a speed boat. Oj said speed boat and wished him a great day. I was a little concerned. I had spent the last hour looking at the whale chart on the wall of the tour center, and had spent much of that hour comparing the dolphin to the larger whales on the wall. This girl can kill time. With all my newfound knowledge of whale size, I was an expert on just how enormous these humpback and gray whales are. These waters are famous for the largest of them, and we were promised this tour would get us ‘as close as possible.’ I asked the driver if maybe we could stay as far as possible-dead serious face on-and he laughed. The external effects are something only my husband and mom notice…I must begin to reek of fear or something. (I also shake, breathe heavy, and repeat ‘Oh my gosh, Oh my gosh’ over and over… that could be the more obvious give-away.) I looked around at the three other couples around us, all in hiking boots and wearing hats and t-shirts displaying previous adventurous accomplishments, like climbing mountains and deep sea diving. They chose this torture for pleasure! Luckily, a 75 year old woman was sitting next to me. She too had been dragged by her spouse against her will. I liked her immediately. My fear completely melted away. 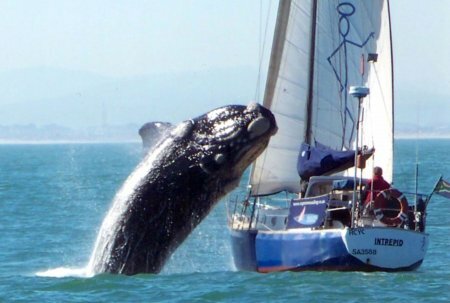 Sure, it came back when I watched these enormous creatures swim under our boat and to the other side, but the moment when I was more in awe than in fear was the moment I suppose adventurous people do this sort of thing for. It was absolutely captivating, and one of my all time favorite experiences in my life. The four hours I spent on that little raft made me realize that far too often, I wait to see something great before I have faith that God will do something great. I know in my heart that God loves me so much, and that he is protecting me, and that His will is perfect for my life. He is taking us on a journey and our job is to trust Him and grow with Him, learning more about Him as we go from point A to point B, but my faith is so small that I stay in the same place, with my eyes closed, until I arrive. I don’t want little teeny baby faith. If I could have that Friday afternoon on the boat back, I would keep my eyes open-no matter how scared I was- the entire ride to the middle of the ocean. Because that is exactly where we grow.